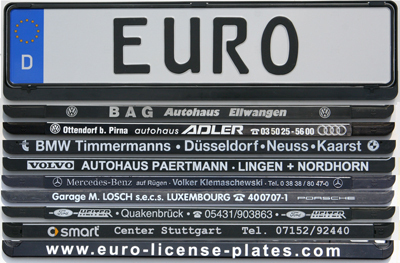 The plate city code and registration number you receive will vary from the one shown on the picture, which depends on stock availability. Due to the always changing stock of available mounting frames, the car dealer and city names will vary from the ones on the picture. You will always receive a frame with the logo or name of the car brand you ordered on it. The frames shown at the picture above are examples.